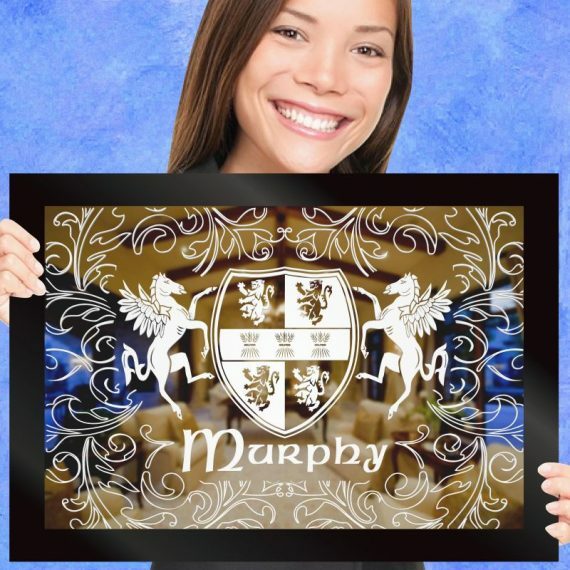 Decorative border artwork complements the elegant, flowing fonts in this etched mirror design. 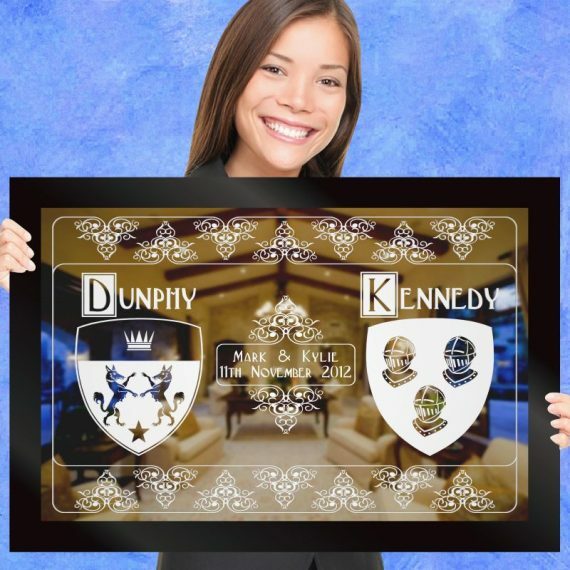 Size: 20"x14"
Our unique version of the ever popular traditional coat of arms etched mirror in all its glory. 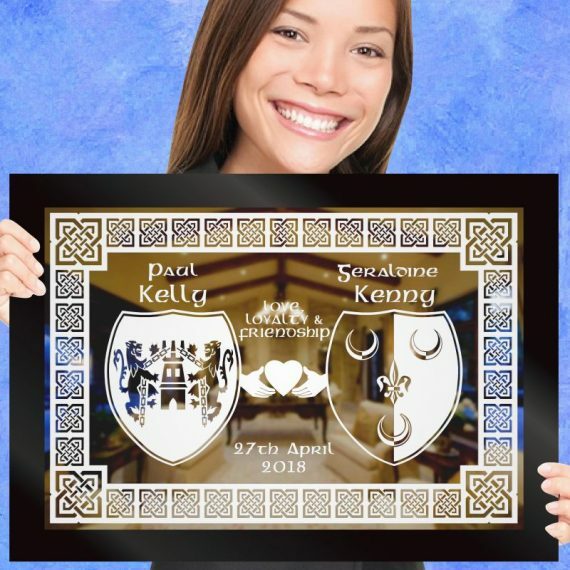 Size: 33"x23"
A distinctive Celtic border & the Claddagh design combine beautifully to create this coat of arms etched mirror design. Size: 20"x14". 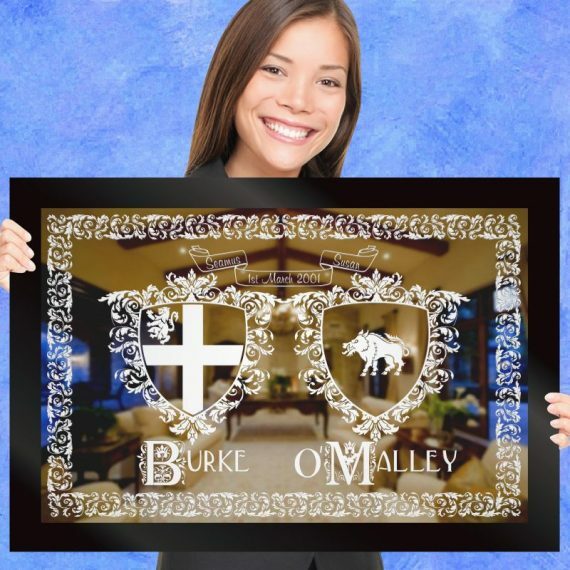 The delicate border design contrasts strikingly with strong, eye-catching lettering to produce this coat of arms gift mirror design. Size: 33"x23". 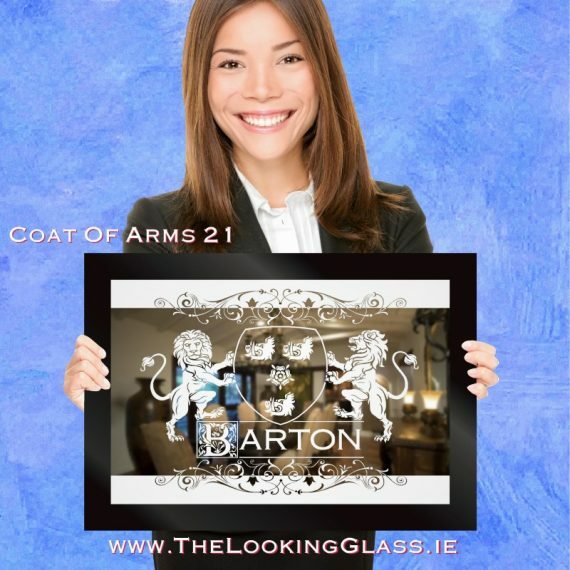 Decorative floral lettering and intricate border design set the tone for this charming coat of arms etched mirror. Size: 33"x23". 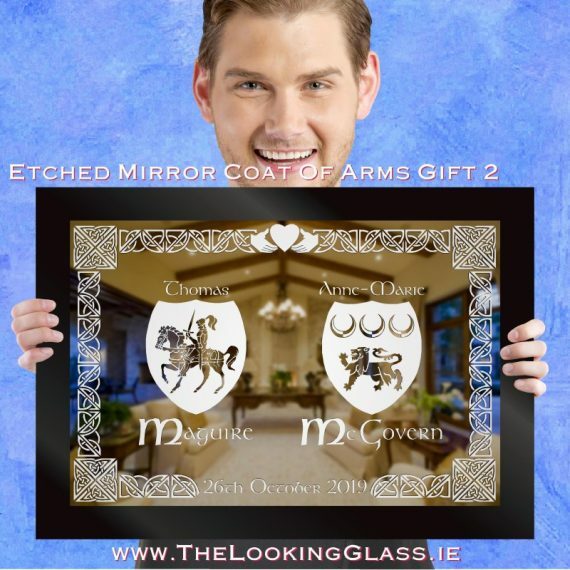 The mythical flying horse 'Pegasus' holds your family coat of arms aloft in this framed gift mirror etching. Size: 20"x14". 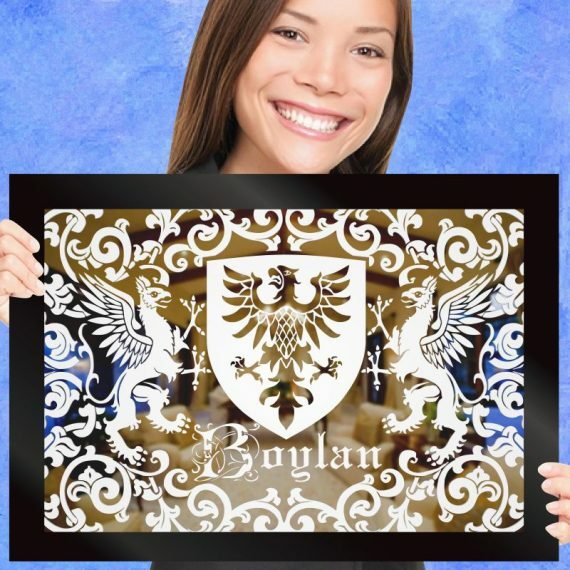 Your family coat of arms shield is supported by two Griffins in this medieval-styled coat of arms etched mirror. Size: 20"x14". 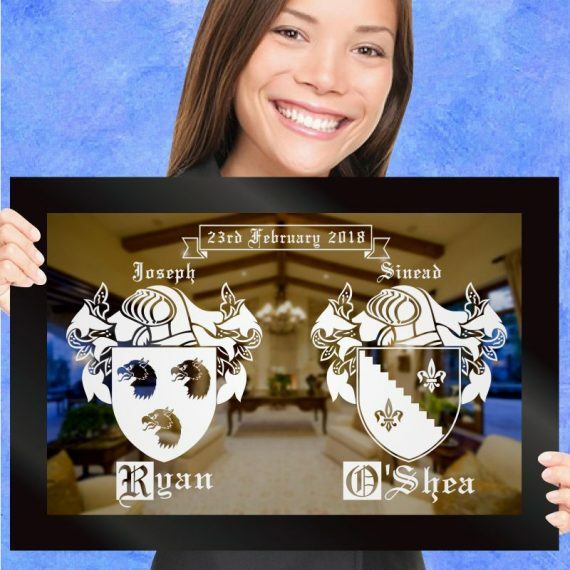 Two ‘Lions Rampant’ hold your family coat of arms aloft in this etched, framed gift mirror. 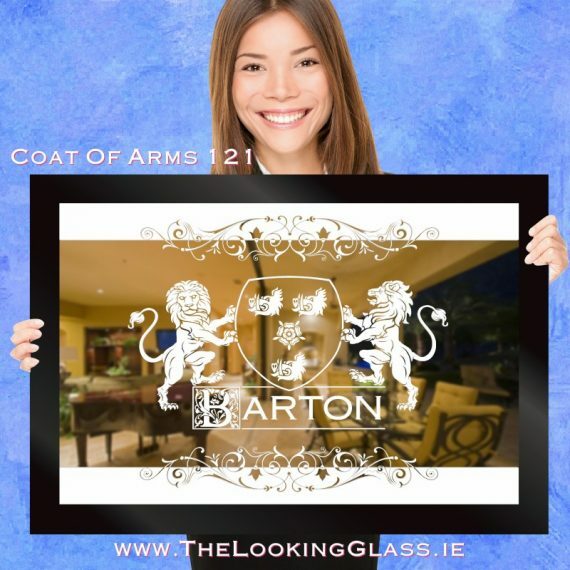 Size: 33"x23"
Two 'Lions Rampant' hold your family coat of arms aloft in this framed gift mirror etching. Size: 20"x14". 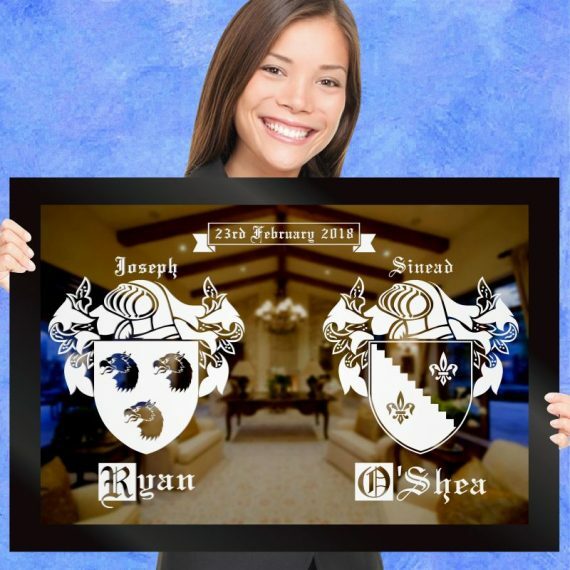 Our unique version of the ever popular traditional coat of arms etched mirror wedding & anniversary gift. Size: 20"x14". 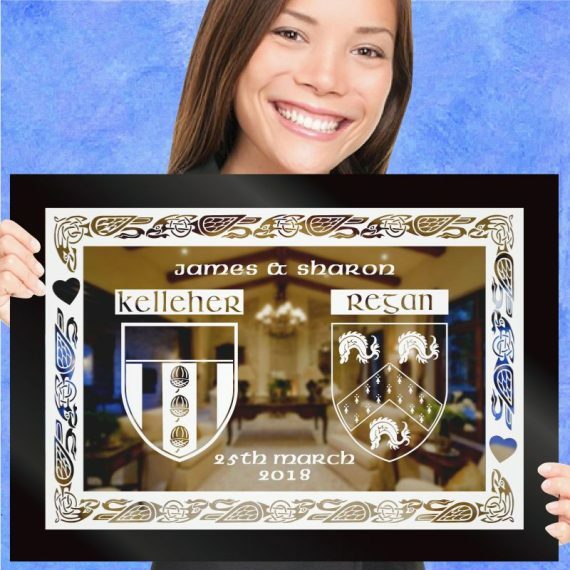 A Celtic-style knotwork border design complements the coats of arms & Gaelic fonts on this gift for weddings & silver, ruby & golden wedding anniversaries. Size: 20"x14". 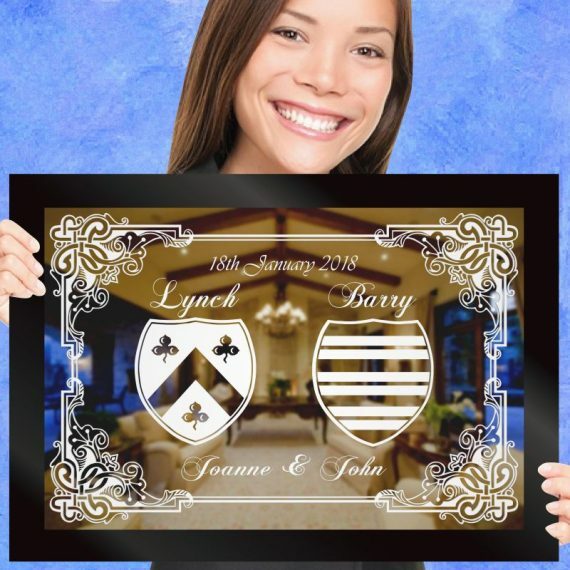 A Celtic-style, animal border design complements the coats of arms & Irish fonts on this etched mirror gift. Size: 20"x14".